Behind the MAFO-Card is a network of experienced and well-coordinated market research providers who offer a wide range of market research services. The MAFO card can be applied for and used free of charge. For whom is the MAFO card intended for? The MAFO-Card is dedicated to market researchers, marketers, product managers, general managers, as well as others who work with the implementation of market research and strategy projects. What are the main benefits MAFO-card? Our network of market research providers guarantees users the best possible and most efficient solution for their market research project. The process is extremely convenient for users, as the MAFO-Card network takes care of the selection of the right supplier/s. In addition, MAFO card users are given the opportunity to request specific services from the participating providers on special terms and can benefit from exclusive additional services. The use of the MAFO-Card is completely free of charge and non-binding. 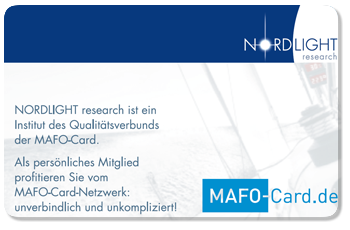 For further questions, please do not hesitate to contact us, +49 (0)211 179660-0 or info@mafo-card.de.